Easy to use interface for modders to save&reload in-game variables (e.g. MCM settings) to/from file. Dynamic Magicka and Stamina Growth 1.3.1 + Ensure you have the correct SKSE64 version for FISS. Skyrim Wayshrines - Immersive Fast Travel - SWIFT SE Required to save and load MCM presets. Spell Learning and Discovery SSE (Optional) If you want to use import/export features you should install it. FISSES will transfer none English words to HEX string for file name now, in order to prevent from some translated pex files. FISSES will transform characters \r \n now. Esmify FISS.esp to ensure any MCM MOD with FISS will be loaded after FISS.esp. There's also a none ESMify version for optional download. Provide an INI (fiss.ini) to control the debug recording message, default is OFF. FISSES now can handle special characters for XML string data like: < > & ' "
Support for global filenames (e.g. "c:/myfile.xml" ) added. Fix the issue that XML writer LOG always prints the same function name. Add some information for LOG, like mod name, file name. Change ESP form ID 43 to 44. FISSES now supports multiple threading (see explain below). Every FISSES script object has own private load/save string variable to record a C-object pointer. then if the script call endLoad() or endSave(), fiss.dll will release the object at the end. My English may not be good, because my first language is not English. mod author is no longer available, and the original author lost his FISS source code too. Therefore I decided to analyse the original FISS XML file format and recreated FISS. Actually FISS XML file format is quite simple, we don't need a complicated implement. So you can see my XML parser or writer in the source code is very simple too. 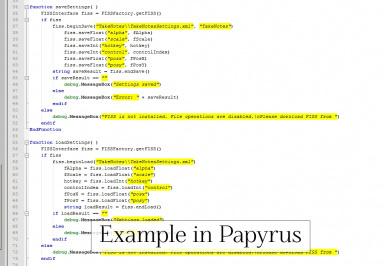 Papyrus script and fiss.dll implement are totally rewrited !! So maybe there are some issues that I didn't notice, hope you guys can understand. All API is the same as before, please reference the old FISS MOD description !! - Already Esmify FISS.esp to ensure any MCM MOD with FISS will be loaded after FISS.esp. to improve the performance when loading/saving huge data, like Journal MOD﻿. and it's also an independent module. So technically, it shouldn't need to update to work unless SKSE64 change the data structure. If you guys encounter any issues in the latest version of SKSE64 in the feature, please tell me. I will re-build the FISSES source code for latest version.